We thank Lane Kenworthy, Jacob Hacker and Paul Pierson, Will Wilkinson, and Larry Bartels for their contributions to last week’s rountable on Unequal Democracy. For future reference, you can find all of their posts here. There is also a link in our list of subject categories at right. We plan to do future roundtables on other notable political science books. Suggestions welcome. Rather than respond directly to Larry Bartels’ response to my comments on (one part of) his book, I’d like to say something about what I see as the agenda for American political economy, and about Unequal Democracy’s contribution to this agenda. In my view of American political economy, the outcome of interest is the well-being of the American population, with an emphasis on the lower two thirds and particularly the bottom third. 1. What constitutes “well-being”? Some candidates: income, assets, consumption, employment, economic security, safety, health, opportunity, capabilities, liberty, mobility, life satisfaction. To what extent are there tradeoffs? Should we prioritize level or improvement? Relative well-being (equality) or absolute? How much weight should be given to people in other countries? To future generations of Americans? Democratic control of the presidency has contributed to growth-oriented macroeconomic policy and redistributive social policy, producing faster income growth for households in the bottom 80% of the income distribution. Despite their apparent economic interest in voting for Democratic presidential candidates, a surprisingly large (and fairly constant) share of low-income whites haven’t. Low-income Americans often have limited knowledge about policy and politics. Senators’ voting has corresponded far more closely to the preferences of the affluent than to the preferences of the bottom third. For me, two things stand out about Unequal Democracy’s contribution to American political economy. One is that so many interesting and relevant hypotheses are advanced and tested, in a sophisticated and nuanced way, in a single book. I read (and reread) the book with a mixture of appreciation, awe, and envy. The other is that the book looks directly at (one measure of) the outcome of interest: the well-being of the middle class and the poor. Jacob Hacker and Paul Pierson rightly point out that if our concern is income inequality, Bartels’ data miss the separation that’s been occurring between the top 1% and everyone else. Yet Bartels’ finding that income growth for the bottom four fifths has tended to be much faster under Democratic presidents than Republican ones is striking and important. Will Wilkinson asks an interesting question: If lower-income persons tend to be misinformed about what party and/or policies will best advance their well-being, is it a bad thing that Congress is less responsive to their preferences than to the preferences of people with higher incomes? I doubt it’s systematically the case that the well-off favor policies more helpful to the poor than those favored by the poor themselves. Still, in a representative democracy in which elections are reasonably open and fair, I don’t have a problem with policy makers ignoring undesirable or ineffective policy preferences held by the poor. To what degree do Democratic presidents and/or Congresses do a better job at advancing the well-being of the bottom two thirds? 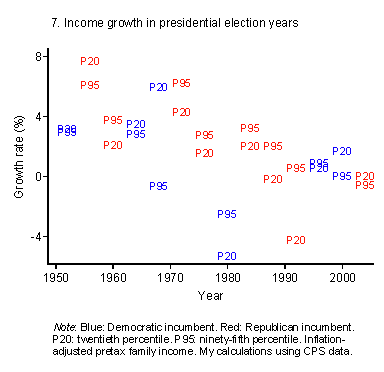 On the one hand, the partisan effect of presidents on income growth appears to have weakened considerably since the 1970s (see figures 3 and 10 here). On the other hand, the recent battle over health-care reform is just one more example, on top of those examined in Unequal Democracy, of how party control seems clearly to make a difference. What effects does rising economic inequality have on democracy and policy? Whether the point of a democratic system should be to reflect citizens’ preferences or their interests is one of the biggest and most vexed issues in democratic theory. Unlike many economists, Wilkinson is refreshingly willing to entertain the possibility that citizens do not know what is good for them. And when they don’t, he comes down firmly on the side of “improving the welfare and opportunity of the poor” rather than attempting to “equalize political voice” for its own sake. My own position on this issue is closer to Wilkinson’s than he seems to suppose. Despite these qualms, I consider the responsiveness or unresponsiveness of a government to its citizens to be a very important social fact. After all, for many people responsiveness is a hallmark of democracy, and they deserve to know how much reality there is behind the mythology. Moreover, equal responsiveness could (and, I think, should) be viewed as intrinsically valuable, even if it results in policies that are less than optimal from a narrowly utilitarian perspective, because it connotes respect for the equal dignity and worth of all citizens. Wilkinson focuses on political ignorance and disengagement as threats to the ability of low-income citizens, specifically, to protect their own economic and political interests. “It would be ideal,” he writes, “were each and every citizen to have the income and education typical of well-informed, motivated voters.” This seems to me to overstate both the strength of the correlation between income and political information and the ability of well-informed citizens to make sensible political decisions. For example, my analysis suggests that affluent voters are, if anything, more likely than low-income voters to engage in myopic retrospection (table 4.4), and that increasing political attentiveness sometimes makes people more likely to deny uncongenial facts (figure 5.2). Many other scholars have produced many similar examples. Findings like these have cured me, at least, of the notion that the views of well-informed people might provide a reliable basis for assessing the “enlightened preferences” of less-well-informed democratic citizens (see here), much less an acceptable substitute for them. Finally, Wilkinson complains that I offer “surprisingly little discussion of the way specific policy initiatives might help or harm the poor and middle classes.” I agree that “we need policies that will actually work”—and that affluent voters (and politicians!) may be “more interested in signaling concern for the welfare of the poor … than in actually getting down to the business of finding out what would really improve it.” But alas, I am not a policy analyst, and determining what policies will actually work is not my comparative advantage. I chose the specific policies I focused on—the Bush tax cuts, estate tax repeal, and the minimum wage—in part because their implications for “the welfare of the poor” seem comparatively straightforward. Armies of economists have spent decades studying the effects of minimum wage laws. My reading of the evidence suggests that, for politically relevant wage levels, the negative effects on employment are small and the positive effects on the incomes of the working poor are substantial. Of course, the work I cited to that effect by David Card and Alan Krueger and David Lee may be unpersuasive to Wilkinson; but in that case, how likely is it that “some evidence” of my own would convince him “that the minimum wage actually helps”? The economic literature on the effects of taxes is equally voluminous, and here too I have had to leave the heavy lifting to others. In any case, not even enthusiastic proponents of estate tax repeal pretend that it would bolster the well-being of the poor; rather, they argue that restricting the liberty of rich kids to inherit their parents’ millions would be fundamentally unjust. My tabulations showed that, since the late 1940s, the real incomes of families at the 80th percentile of the income distribution have grown 70% faster under Democratic presidents than they have under Republican presidents. The real incomes of families at the 60th percentile have grown more than twice as fast under Democrats. Families at the 40th percentile have experienced three times as much real income growth under Democrats. Cumulated over more than half a century, these partisan differences have been hugely consequential for the economic well-being of the broad American middle class. The partisan differences in income growth for families who really are near “the bottom portions of the income ladder” have been even larger in percentage terms—and even more consequential in human terms. To think of all this as a sort of sideshow to the real story of hyper-concentration of income going to the top 1 percent strikes me as an instance of “misplaced focus,” to borrow Hacker and Pierson’s phrase. For one thing, there is ample evidence in the book that voters are often driving policy outcomes—by electing Democratic or Republican policy-makers. The movement to repeal the estate tax involved arduous effort by organized interests, but it is no coincidence that that effort only began in earnest when Republicans won the House in 1994, and achieved (temporary) victory within months of the election of a Republican president in 2000. Similarly, the Bush tax cuts were championed by powerful interest groups, but they never would have seen the light of day if a thousand more voters in Palm Beach had succeeded in voting for Al Gore. In both these cases, it seems unhelpful to think of “politics as electoral spectacle” and “politics as organized combat” as mutually exclusive alternatives. The interplay of these factors is even clearer in my chapter on the eroding minimum wage. As Hacker and Pierson note, my analysis of minimum wage policy-making assigns a major role to the declining clout of labor unions. But partisan control of the White House and Congress also mattered substantially. Moreover, the terms of “organized combat” seem to have been significantly shaped by partisan politics: the estimated impact of labor union strength was almost twice as great under Democratic presidents as it was under Republicans, and the estimated impact of the partisan composition of Congress was three times as great under Democratic presidents as it was under Republicans. There is, of course, much more to be learned about the role of labor unions, businesses, and other powerful organized interests in the politics of inequality, and in contemporary American politics more broadly. Thus, I enthusiastically second Hacker and Pierson’s closing call to “look more closely” at “the organized combat that is taking place in the trenches of American politics on a daily basis.” The primary reason why I haven’t done more of that myself is that it is tremendously difficult; the inferential challenges involved in using observations of “politics as organized combat” to “tell us who is” driving policy outcomes—and how those policy outcomes matter—are enormous. Fortunately, Hacker and Pierson’s own terrific new book, Winner-Take-All Politics, provides an excellent full-scale model of the sort of analysis they advocate, and an excellent sense of how richly analyses of this sort can contribute to our understanding of the political process. As a regular reader of The Monkey Cage, I am delighted to help launch what I hope will be a vibrant series of discussions of new and old books by political scientists. And as the author of Unequal Democracy, I am very grateful to John Sides and Henry Farrell for recruiting such a smart and stimulating set of commentators to share some of their thoughts about my book. I will attempt here to respond to just a few of their points, trusting that they and others will continue the conversation. Kenworthy extends this argument by suggesting (1) that shifts in party identification may also reflect differential income growth, but with less myopia than we observe in voting behavior, and (2) that the distinctive partisan politics of the post-war South may reflect distinctive regional patterns of differential income growth. I am sympathetic to both suggestions, and intrigued by the preliminary evidence he has adduced in support of them. In much the same spirit, Chris Achen and I have attempted to reinterpret the New Deal realignment as largely a matter of myopic retrospection rather than ideological conversion (see here). FDR’s electoral gains in 1936 came mostly in states where income growth in 1936 (but not in 1934 or 1935) was especially robust—not in states that otherwise displayed any particular affinity for progressive economic policies. Voters in a variety of other democracies hard hit by the Great Depression demonstrated an impressive willingness to replace “ins” of every ideological complexion with an equally varied cast of “outs,” including conservatives (in Britain and Australia), nationalists (in Ireland), Nazis (in Germany), social democrats (in Sweden), socialists (in the Canadian prairie province of Saskatchewan), and followers of a funny-money radio preacher (in the adjacent prairie province of Alberta). In every one of these cases, the party that happened to be in power when the economy rebounded went on to dominate politics for a decade or more. Although we lack survey data on party identification from the New Deal era, our analysis of congressional voting provides some evidence that they did so, at least in part, because myopic retrospections got solidified into partisan loyalties. Pooling data from non-southern congressional districts in the elections of 1936, 1938, and 1940, Achen and I estimated that election-year income growth (measured at the state level) had a fairly strong positive effect on Democratic vote shares (.23). Income growth in the previous election year, two years earlier, also had a significant effect (.17). Was that because voters employed a relatively long time horizon in assessing the Democratic Party’s performance? We think not, since income growth in the intervening (odd-numbered) years had a noticeably smaller effect (.11). Our interpretation is that voters made their assessments of party performance at election time, with a good deal of myopia, then updated their party identification accordingly and carried it forward to the next election (see here). The idea that party identification reflects an accumulation of short-term retrospections is consistent with the Bayesian model of partisanship developed by Achen and others. However, the “saw-tooth” pattern discernible in congressional election results in the New Deal era suggests that the “running tally” of party identification (in Morris Fiorina’s felicitous phrase) may be something more like a limping tally, incorporating economic experience primarily in even-numbered years, when American voters happen to go to the polls. Of course, aggregated congressional voting data shed only very indirect light on the evolution of partisanship, and our statistical results from the New Deal era are no more than suggestive. Why not examine party identification directly? One way to do this would be to look for evidence of election-related retrospection in aggregated time-series of “macropartisanship.” Another would be to harness more than half a century of high-quality individual-level survey data gathered by the American National Election Studies. I once attempted something like the latter in a paper focusing on the development of party identification over the life cycle; the results were not pretty, but they may help inspire Kenworthy or someone else to produce a more tractable and comprehensive analysis of partisan updating. Kenworthy’s interest in class politics adds some additional complexities. Most notably, in the case of the postwar South, his focus on low-income whites leaves unaddressed the partisanship and voting behavior of middle- and high-income whites. Unlike low-income white southerners, more affluent white southerners have abandoned the Democratic Party in droves over the past half-century, producing class polarization in voting behavior well beyond the levels observed in other parts of the country. For their behavior to fit Kenworthy’s story would seem to require that their experience of income growth (or their response to income growth) under Democratic and Republican presidents was quite distinct from that of low-income white southerners, and of middle- and high-income whites in the rest of the country. If that turns out to be the case, then Kenworthy’s account (which he modestly refers to as “the Bartels theory”) will look even more promising. There are many lines of argument in Larry Bartels’ important book Unequal Democracy, and I’m in no position to constructively evaluate the most data-intensive among them. But I think I can discern a general overarching argument, and I hope I’ll be able to say something useful about that. Central to all versions of the Inequality Road to Serfdom arguments are a set of assumption about the convertibility of economic power into political power and a set of assumptions about the self-interested motivation of voters. The plausibility of the argument stands or falls on the plausibility of these assumptions. …especially troubling because they suggest the possibility for a debilitating feedback cycle linking the economic and political realms: increasing economic inequality may produce increasing inequality in political responsiveness, which in turn produces public policies that are increasingly detrimental to the interests of poor citizens, which in turn produces even greater economic inequality, and so on. One of my chief difficulties with Unequal Democracy is that it is unclear how the inequality-reducing redistributive policies Bartels seems strongly to favor would make any difference whatsoever to this sort of dynamic. Is the idea that senators pay more attention to their lower-income constituents when those constituents receive more generous government transfers? Bartels says that wealthier Americans are more likely to know about politics and more likely to actually contact their representatives. But it’s not clear to me how progressive redistribution decreases the level of knowledge or engagement of the wealthy relative to the poor. Perhaps this could be clarified. Income-related disparities in political knowledge raise another profoundly important question that Bartels seems to me to avoid addressing directly. Would equalization of political responsiveness make lower-income voters better off? In Unequal Democracy, Bartels argues that the American electorate is characterized by myopic retrospective voting, meaning that the decisions of voters are heavily influence by past economic performance—but only very recently past performance. Bartels also shows that lower-income voters are especially bad at assessing the effects of very recently past economic performance on their economic interests; their behavior at the ballot box is actually more sensitive to how the wealthy have recently fared. Bartels characterizes this as “false consciousness,” but it is probably more fruitfully described as ignorance. As it happens, lower-income voters are also more likely than wealthier voters to vote from the pocketbook. (The salience of “social issues” increases with income.) The problem is that lower-income voters are relatively poor at accurately evaluating the complex relationship between past performance, policy, and their economic welfare. Bartels argues that, generally, “ordinary citizens fail to translate their broad values and ideological impulses into consistent views about specific policy issues.” In his discussion of the Bush tax cuts, he notes that “those who said they supported more spending on a variety of government programs were more likely to favor the tax cut.” Bartels sensibly adds that “These results suggest a good deal of confusion in the connections between people’s political values and their policy preferences…” And Bartels observes that a voter’s level of political information makes a difference. Poorly-informed voters are less likely to know which party supports which policy. If we add this mix the finding that low-income voters are least likely to be well-informed voters, then it becomes very puzzling indeed how it is that increasing the influence of low-income voters relative to middle- and high-income voters is supposed to improve their fortunes. First, the correlation between class positions and political views is not so substantial that support for egalitarian policies is limited to “those mired in poverty.” Just as many poor people espouse antipathy to redistribution and the welfare state, many affluent people support egalitarian policies that seem inconsistent with their own narrow material interests. Insofar as the political activism of affluent egalitarians “does perform as advertised,” policymakers may be much more generous than the political clout of the poor would seem to warrant. On its face, almost all the data Bartels brings forth about political knowledge and engagement seems to imply that it is a good thing for the poor that they have so little influence! That is not, I take it, what UD is intended to establish. But doesn’t the argument imply this? And doesn’t this call into question the idea that increasing inequality should be expected to produce the sort of “debilitating feedback cycle” Bartels posits. Indeed, it’s hard to see how such a loop would even get started. If, as Ronald Inglehart finds, people get less materialistic as they get wealthier, and become more motivated to vote according to social conscience rather than economic self-interest, then it would seem that the wealthier a society gets, the more likely will be that the best-informed and most politically influential voters will have the interests of the poor in mind. Wasn’t 2008 the apex of the recent trend in rising income inequality? And didn’t a record proportion of high-income voters choose the avowedly pro-redistribution Democratic presidential candidate that year? I’m pretty uncomfortable with the “white man’s burden” aspects of the idea that it is good for the poor to be democratically underrepresented relative to the rich, but curious to know why Bartels does not address the idea more directly. As I’ve argued at length elsewhere, inequality is a distraction and the real issue is that of improving the welfare and opportunity of the poor. The real issue is whether policy intended to do this “performs as advertised,” as Bartels puts it. It is not surprising that the poorest Americans are generally the least well-educated and have the least access to information about politics and policy. Everyone should have the means to make informed and effective democratic decisions. It would be ideal were each and every citizen to have the income and education typical of well-informed, motivated voters. To get closer, we need policies that will actually work to promote broader prosperity and a fuller realization of basic human capacities. We may want to equalize political voice, but then we need to know what would make that happen, and the democratic public has to vote for it. My worry is that lower-income voters are poorly positioned to act as democratic advocates on their own behalf, and that higher-income voters are more interested in signaling concern for the welfare of the poor (and for the environment, etc.) than in actually getting down to the business of finding out what would really improve it. I suspect that if there were more bona fide concern, there would be much less interest in strong signals, like party affiliation, and much more concern with the ins and outs of policy. Before I close, I’ll note that there seemed to me a frustrating question-begging air hovering about Unequal Democracy. Bartels does argue, and at length, that lower and middle-class Americans fare better economically when a Democrat is in charge of the executive branch of the federal government. The methodological grounds for focusing on the party of presidents rather than on the partisan composition of the legislature remains unclear to me. And the mechanism underlying Bartels’ truly striking correlations remain for me (and I suspect for many others) mysterious. I think this vagueness about mechanism has something to do with why I kept getting the nagging sense reading Unequal Democracy that Bartels cares too little about policy and too much about the Democratic Party. At many points in Unequal Democracy, Bartels’ rhetoric leaves the reader with the impression that Democratic policies, whatever they may be, will be tend to be better for the poor and middle-classes than will Republican policies. But Bartels offers surprisingly little discussion of the way specific policy initiatives might help or harm the poor and middle classes. The chapters of Unequal Democracy that are devoted to specific policies concern the Bush tax cuts, the estate tax, and the minimum wage. But Bartels does little in those chapters to illuminate how it is exactly that increased government revenue or a bump in the minimum wage would actually help. Again, what are the mechanisms? A trillion dollars in tax revenue certainly doesn’t help disadvantaged families in Chicago and Miami when the government squanders it dropping bombs on disadvantaged families in Iraq and Afghanistan. Is the problem really that there is too little money in the system to effectively finance programs that would really help the poor, or is the problem that the money that is in the system is captured and misspent by the various interest groups that make up both parties? Sure, but the American political system was designed to be occasionally unresponsive to public sentiment, and for a number of pretty good reasons. The evidence that the minimum wage is harmful remains at least as strong as the evidence that it isn’t. Suppose it is harmful. In that case, the limited and selective responsiveness of the American political system might look like a feature, not a bug. I think that if one is committed to prioritizing the welfare of the least well-off, given what Bartels tells us about political ignorance and engagement, it will look like a feature. But if one is committed to a certain substantive ideal of democratic equality, it will look like a bug. Unequal Democracy is what good political science should be. 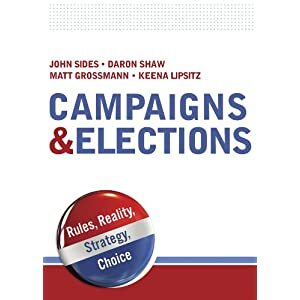 It tackles an extraordinarily pressing problem with sophistication and subtlety, and casts powerful light on the barriers to effective expression of voters’ views in Washington. Based on extensive and very wide-ranging research, the book embodies an admirable conviction that on such a broad topic, multiple lines of inquiry and diverse sources of evidence are essential. The experience, creativity and insight of its author is on display throughout, and arresting findings practically spill off the pages. It is hard to imagine another social scientist pulling this off. What’s more, the book’s disturbing bottom line – that voters face such difficulties monitoring and weighing in on policy and governance that they generally can provide only a very limited check on policy-makers – is persuasive and essential. Anyone who doubts that in the politics of inequality, political and economic elites generally have the upper hand will have to grapple with Bartel’s formidable book. And yet, we do think there are some major problems in the analysis offered in Unequal Democracy – inevitably so given the scale of the subject matter, but nonetheless with substantial costs to our understanding of the book’s vital subject. And since it is interrogation of the weaknesses in scholarly analysis and not just celebration of its strengths that leads to further scholarly progress, we will focus on the problems here. In the interests of space, we mention just three (in ascending order of importance): citizen attitudes on taxes and economic policy, the role of partisanship in generating distributional outcomes, and the implications of voters’ limited capacity to constrain policy-makers. We provide much more detailed discussion of these and related issues in a recently published book. First, as we have argued elsewhere, even as Bartels offers an extremely nuanced take on public attitudes towards taxes and other policy issues, he frames the matter in a way that suggests much higher levels of support for tax cuts than is justified. As Mark Hansen has argued, survey questions that simply ask whether voters favor a particular tax cut, without mentioning alternative uses of that money, are not very meaningful, because voters provide answers that simply don’t add up. Asked in this manner, voters favor virtually all tax cuts. Asked the same way, they also favor most spending increases. And they favor a balanced budget. To conclude based on this evidence, as Bartels seems to, that voters favored or supported a particular initiative (such as sharp reductions or elimination of the estate tax – one of the least favored tax reductions) seems suspect. To us, Bartels’s analysis highlights how critical the control of agenda-setting is, not that “Homer’s” desire for a tax cut had much to do with the 2001 debate. We show in our 2005 book Off Center that Republicans were well aware of the need for such agenda control, with an internal White House memorandum stating flatly that voters preferred other policy ends to tax cuts and arguing that this meant that trade-offs should be taken off the table. Republicans’ success showed that if you can frame the question as “would you like this tax cut, yes or no?” you may win even if there are many alternative budgetary options that surveys suggest voters would prefer. Bartels’s rejoinder in Unequal Democracy that voters don’t get to decide how the agenda is structured suggests a much thinner view of democracy than we think he holds. And he sometimes veers into suggesting that voters don’t really have views at all. This was not true when it came to the priority they attached to tax cuts (the polls show remarkably consistency and clarity here). And it’s a position that seems at odds with Bartels’s arresting analysis elsewhere in Unequal Democracy when he shows that the opinions of less affluent Americans seem to have little influence on the votes of their senators. To look at the correspondence between public opinion and senators’ votes would seem to imply that people have opinions that senators can and should heed. Second, we have real doubts about Bartels’s strong argument concerning the role of partisanship in the rise of inequality. It is not that we think the parties are identical on these matters – far from it – but we are skeptical about the huge effects that Bartels finds, and the main mechanisms he sees as driving the partisan divergence. Our concerns are two-fold. First, to us the critical rise in inequality is mostly at the top of the income distribution (where the top 1% has pulled sharply away from everyone else), and it has mostly occurred since 1980. Because Bartels relies on survey data on income that are topcoded, however, he has very little to say about the spectacular rise of high-end incomes. In fact, Bartels’s main measure of inequality is the 80/20 ratio, the ratio of income at the 80th and 20th percentiles. Yet the 80/20 ratio leaves out most of the story of rising inequality. According to the CBO post-tax and transfer data, the 80/20 ratio rose from just over 3 in 1979 to 3.77 in 2005-an almost 25 percent increase. Over the same period, however, the ratio of the 99th percentile to the 20th percentile rose from 9.62 to 17.18—an almost 80 percent increase. And a very large share of rising inequality has actually occurred above the 99th percentile – the last generation has truly been one of winner-take-all. As it turns out, when Bartels looks at the relationship between the 80/20 ratio and the partisan identity of the president, the association he finds is driven by the growth of income at the 20th percentile under Democratic presidents, not by the positive effects of Republican presidents on growth at the top. (In fact, the 95th percentile—the highest income group he looks at—seems to do about as well under either party, and in his regressions, Bartels never finds statistically significant partisan differences in income growth above the 40th percentile.) In other words, Bartels’s argument about partisanship boils down to the claim that those on the bottom portions of the income ladder do much worse under Republicans than under Democrats. This is an important insight—leaving open the question of whether it actually reflects the differing policies of Republican and Democratic presidents, as we discuss in a moment—but it does not directly address the issue of why growth has been so skewed toward the very top since the late 1970s. Once we shift our gaze to the biggest fact about American inequality—the steady upward rise of the share of income going to the top 1 percent—a simple partisan story becomes much harder to sustain. Instead, something happened around 1980 that resulted in a fairly consistent upward trend in the fortunes of those at the very top, regardless of the partisan identity of the president (see Lane Kenworthy here). Bartels’s analysis has little to say about this trend, which we think is the crucial one for understanding the rise in American inequality. Not only does he focus on the 80/20 ratio; his analysis is also, by his own admission, much stronger at explaining the ebb and flow of the 80/20 ratio before 1980—that is, before most of the stunning rise in inequality. In other words, Bartels’s analysis is pitched at explaining a measure of inequality that systematically understates the growth of inequality at the very top, and his explanation works much better during the period before the big run-up in inequality occurred. Bartels’s presidential partisanship story not only has serious problems explaining the sustained hyperconcentration of income since 1980, which has continued apace under both Republican and Democratic presidents. It also, we think, ascribes to presidents more independent influence over macroeconomic policy than they actually enjoy in our system of checks and balances in which the President must vie with Congress and the Federal Reserve for influence. Most important, Bartels’s does not, in our view, identify policies that can be plausibly linked the sustained run-up of top incomes. He suggests that the key tool presidents use to change the income distribution is fiscal and monetary policy. Democrats prime the pump, so to speak, with the consequence that working-class income growth is higher under Democrats than under Republicans. Such contractionary and expansionary initiatives, however, seem a better candidate for explaining short-term fluctuations and patterns of income growth than long-term changes in the income distribution, especially sustained gains at the top rather than growth at the bottom. It is doubtful, for example, that the expansive fiscal and monetary policies that bump up lower-income workers’ employment and incomes could be sustained indefinitely. (Indeed, Bartels’s argument about Republican success in producing growth just before elections rests on exactly this kind of short-term dynamic). By contrast, long-term shifts in the income distribution are more plausibly linked to changes in the structure of the economy than to whether or not the economy is operating at peak output levels at any particular time. And yet the role of government policy in creating these larger structural changes – a role that we believe is very extensive (involving areas like financial regulation, corporate governance and industrial relations), and runs through both parties (though in different ways) is notably absent in Bartels’s account. Third, and most important, we would stress that Bartels’ focus on voters can, at best, only bring us a part of the story. It tells us that voters are not driving policy outcomes, but it does not tell us who is. Here, Bartels repeatedly invokes “the immense significance of elite ideology in the making of American public policy” – but this turns out to be merely a residual category. While we think ideology is important, it is probably not the only or even the main thing driving elected officials. Instead, we would highlight the crucial role of organized interests in American politics, and in particular the mobilization of business and corporate groups from the 1970s on, the weakening of organized labor, and the rise of a large constellation of advocacy organizations on the left focused not on material, pocketbook issues but post-material, quality-of-life issues. Indeed, we are struck by the very limited attention that Bartels and other Americanists have paid to organized interests in trying to explain the rise in income inequality – a stance that departs sharply from decades of work in comparative political economy. In Unequal Democracy (as well as McCarty, Poole and Rosenthal’s Polarized America), unions and corporations are hardly mentioned. Unions have four references in the index of Bartels’s book—two related to the minimum wage—while the National Election Study has twenty. Yet in Bartels’ striking chapter on the minimum wage – a chapter that fits somewhat awkwardly in the book – he concludes that union decline alone accounts for 40% of the real decline in the minimum wage. And this is just one policy area, and ignores the most powerful organized actors in the political economy – businesses. Our three points are linked. They all suggest that the marvelous dissection of voters and public opinion in Unequal Democracy succeeds in explaining who isn’t driving policy outcomes. Now we need to understand who is. Here the work of comparative political economists, who have stressed the much wider interconnections between public policy and structures of economic rewards, as well as the centrality of organized economic interests to policy outcomes, needs to come to the fore. As Bartels’s brilliant book shows, political scientists have pushed the study of public opinion and individual political behavior to new heights of sophistication and insight. But from these heights, it is often hard to see the organized combat that is taken place in the trenches of American politics on a daily basis. It’s time for us to look more closely. Why don’t low-income whites love the Democrats? Unequal Democracy is one of the best books on American politics in the past generation. It has few peers in its engagement with important, topical questions based on careful empirical analysis reported in accessible prose. In the fourteen presidential elections from 1952 to 2004, a majority of white voters in the lower third of the income distribution chose the Democratic candidate over the Republican in only four. Why is that? Bartels offers a fascinating answer. I’m going to summarize his argument and findings and attempt to extend them a bit. For most Americans, and particularly for those in the lower part of the income distribution, incomes have tended to grow much more rapidly under Democratic presidents than under Republican ones. From 1948 to 2005, family income at the twentieth percentile of the income distribution (P20) grew at an average rate of 2.4% per year under Democratic presidents, compared to just 0.3% per year under Republicans. Cumulated over time, that’s a huge difference. Despite much hand-wringing by progressive commentators, there has been no decline in the propensity of low-income whites to vote Democratic in presidential elections. But as the chart above shows, that’s partly because the share voting Democratic was pretty low even in the 1950s, 1960s, and 1970s. What’s interesting, and surprising, isn’t so much that it hasn’t decreased; it’s that it was never particularly high. How can that be, given that the Democrats have long claimed to be the party of the people and that the evidence, at least with respect to income growth, supports their claim? The reason, according to Bartels, is not race or crime or feminism or abortion or foreign policy. It isn’t roast beef, apple pie, and postmaterialist values. It’s not religion. It’s not a leftward lurch or a right turn by the Democrats. It isn’t a belief that there’s no difference between the two parties. It isn’t “false consciousness.” The reason is that voters are myopic, and Democratic presidents have been less likely than Republican ones to produce healthy income growth in election years. Does the sharp contrast in overall income growth under Democratic versus Republican presidents have any effect on the partisan preferences of low-income whites? If it’s had little impact on presidential voting because of myopia, perhaps it’s more likely to affect an indicator of deeper, underlying party preference, such as party identification. The data in the following chart are supportive. Lower-income-third whites were more likely to vote Republican than Democratic in presidential elections even in the 1950s and 1960s (chart 1 above), but during those decades this group was much more likely to identify as Democratic than as Republican. The Democrats’ advantage has shrunk (I’ll come back to this), but it has persisted. Though Bartels doesn’t put it quite this boldly, these findings suggest a simple but powerful explanation of party identification and voting among low-income whites: presidents’ success at generating income growth influences party identification and presidential voting, and income growth in election years exerts an even stronger impact on voting. The partisan gap in income growth has varied over time and across regions. This can be used to get additional insight into its impact. The magnitude of the partisan difference in income growth (overall, not just election years) has shifted over time. As the following chart shows, for families at the twentieth percentile the gap between Democratic and Republican presidents was much larger in the 1950s, 1960s, and 1970s than in recent decades. Given this, we should observe a decrease in the gap in party identification among the lower income third. As chart 2 above shows, we do. And the timing fits: both occurred after the 1970s. There also has been significant regional variation in the partisan gap in income growth, as is evident in the next chart. 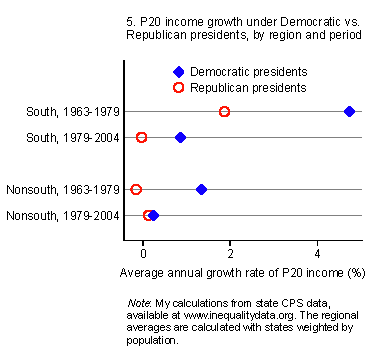 In the period from 1963 (the first year state income data are available) to 1979, the partisan gap in P20 income growth was much larger in the south than in the rest of the country. Moreover, the decrease in the partisan gap between 1963-79 and 1979-2004 was greater in the south than in the nonsouth (though it shrunk in both regions). 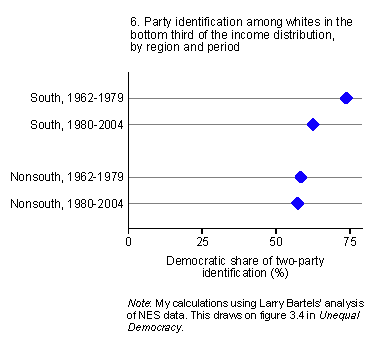 This suggests two hypotheses about regional differences and over-time shifts in party identification among low-income whites: First, through the 1970s Democratic identification should have been stronger in the south than elsewhere. Second, after the 1970s we should observe a larger decline in Democratic identification in the south than in the rest of the country. The following chart shows that both of these hypotheses are supported. Now let me return to voting in presidential elections. Low-income whites have been a bit more likely to vote Democratic since the early 1990s than they were in earlier decades (chart 1 above). The difference isn’t huge, but it appears to be real. Does the theory have an explanation for this? Yes. On the one hand, this development is surprising given that the Democrats’ advantage in overall income growth has lessened (chart 3). But the theory suggests that the partisan gap in election-year income growth matters more, and here the recent trend has been favorable for Democratic candidates. 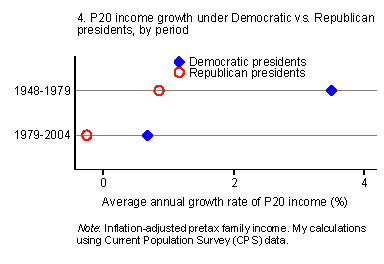 As the next chart indicates, in 1992 and 2004 Republican presidents produced relatively anemic income growth. Democratic presidents did no worse in 1996 and 2004. Given the continued (albeit narrow) Democratic advantages in low-income whites’ party identification and in overall income growth (charts 2 and 4), this new parity in election-year income growth ought to have helped boost Democratic voting among low-income whites. 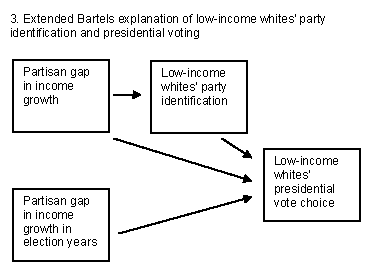 There are other explanations of low-income whites’ party identification and presidential vote choice. How well do they square with the data? Begin with the early postwar decades. The most common view is that Democrats won the hearts of low-income whites with FDR’s New Deal policies. Low-income families benefit from programs that provide income security and/or redistribution, such as Social Security, unemployment insurance, and social assistance, and from laws that help to raise the earnings floor, such as the minimum wage and the right to collective bargaining. The argument is that they therefore favored the party that created and stood by such programs. This view has some difficulty accounting for the regional variation in low-income whites’ party identification during this period (chart 6). A second view about the 1950s and (early) 1960s is that party orientations and voting were not based mainly on material self-interest, but rather on Civil War legacies. In this account, there never was a New Deal golden age in which the Democrats won the allegiance of low-income Americans by virtue of their commitment to economic opportunity, security, and fairness or via their superior performance in raising incomes. Low-income whites in the south, like most whites in the south, identified with and voted for the party that hadn’t launched the war of northern aggression. Outside the south low-income whites were more evenly split but leaned Republican. An empirical problem for this hypothesis is the Democrats’ advantage in party identification outside the south (chart 6). What about the period since the 1960s, or perhaps since the 1970s if we consider the late sixties and the seventies a transition era? The most prominent view is that low-income whites have turned away from the Democrats over social issues such as race, abortion, homosexuality, and school prayer. The seeming weakness of this account, as Bartels notes, is that this group’s propensity to vote for Democratic presidential candidates has not decreased (chart 1). A second view holds that in recent decades material issues have become more, rather than less, central to low-income whites’ partisan considerations, due to the parties’ ideological purification and their separation on economic issues. The Republican party has moved to the right and conservative southerners have switched from the Democrats to the Republicans. As a result, both parties have become less heterogeneous and the difference between them on economic issues has become much clearer than during the New Deal era. A problem for this account, it would seem, is the lack of increase in Democratic identification among low-income whites outside the south (chart 6). 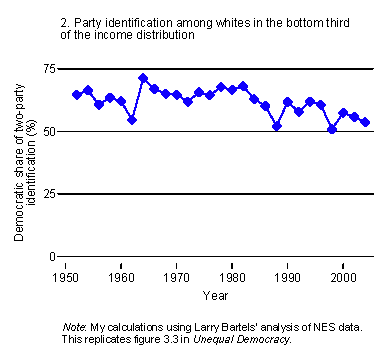 I’ve offered an extension of Larry Bartels’ partisan-gap-in-income-growth explanation of low-income whites’ political preferences, an extension of the empirical assessment utilizing over-time and cross-region variation in the partisan gap in income growth, and some brief comments on a few prominent alternative accounts. The Bartels theory looks promising. fn1. 1952 is the first year for which data are available, and Unequal Democracy was published prior to the 2008 election. This updates a finding by Jeffrey Stonecash in his Class and Party in American Politics. fn2. Unequal Democracy, chapter 2, especially figure 2.1. These incomes are pretax, adjusted for inflation; the data are from the Current Population Survey (CPS). Bartels lags income growth one year; for instance, 1993 is counted as a Republican year and 2001 as a Democratic one. fn3. Unequal Democracy, chapter 3, particularly figure 3.2. I’ll sidestep the question of whether low income is a good indicator of “working class”; I want to focus here on low income. fn4. Unequal Democracy, chapter 4, especially figures 4.2 and 4.4. The logic is similar to that in “Douglas Hibbs’ “bread and peace voting model (pdf). fn5. More detail here. The data I use in chart 4 are the same as those used by Bartels. fn6. The south here is Alabama, Arkansas, Delaware, Florida, Georgia, Kentucky, Louisiana, Maryland, Mississippi, North Carolina, Oklahoma, South Carolina, Tennessee, Texas, Virginia, and West Virginia. fn7. See also figure 4.2 in Unequal Democracy. I show income growth at both P20 and P95 in the chart because Bartels finds the latter to be more closely correlated with bottom-income-third whites’ vote choice. fn8. Ruy Teixeira and Alan Abramowitz, The Decline of the White Working Class and the Rise of a Mass Upper Middle Class. fn9. Stonecash, Class and Party in American Politics. fn10. Thomas Edsall with Mary Edsall, “Chain Reaction”:http://books.google.com/books?id=GL80BQR6pk0C&dq; Thomas Frank, What’s the Matter with Kansas? This week we will be hosting a roundtable on Larry Bartels’s book Unequal Democracy. This book, first published in 2008, has occasioned a great deal of debate about the sources and consequences of inequality in the United States. Here is Bartels talking about its origins. See also his earlier posts at Talking Points Memo. Here is his homepage. Ours is not the first such roundtable—see here or here (gated). But this roundtable will offer not only several unique perspectives but also the opportunity to draw on research on inequality that has been conducted since the book’s debut. Lane Kenworthy is a Professor of Sociology and Political Science at the University of Arizona and the author of the blog Consider the Evidence. Paul Pierson and Jacob Hacker are Professors of Political Science at, respectively, the University of California, Berkeley and Yale. They are the authors of Winner-Take-All Politics (here and see also Henry’s review), which also investigates the politics behind growing inequality in the United States. Will Wilkinson is a writer and blogger whose work appears or has appeared in multiple places, including The Week, the Atlantic Monthly, and The Economist (he is W.W. here), among others. With Brink Lindsey, he is working on a book tentatively titled The Free-Market Progressive. Here are his thoughts on Unequal Democracy, as of p.3 of the book. We are grateful to all of them. Today and tomorrow, The Monkey Cage will feature their reviews of the book. Bartels’s response to each review will follow. We invite readers to comment at any point.